A busy bag is a simple activity for younger kids that is portable and can help keep little kids occupied for short periods of time. 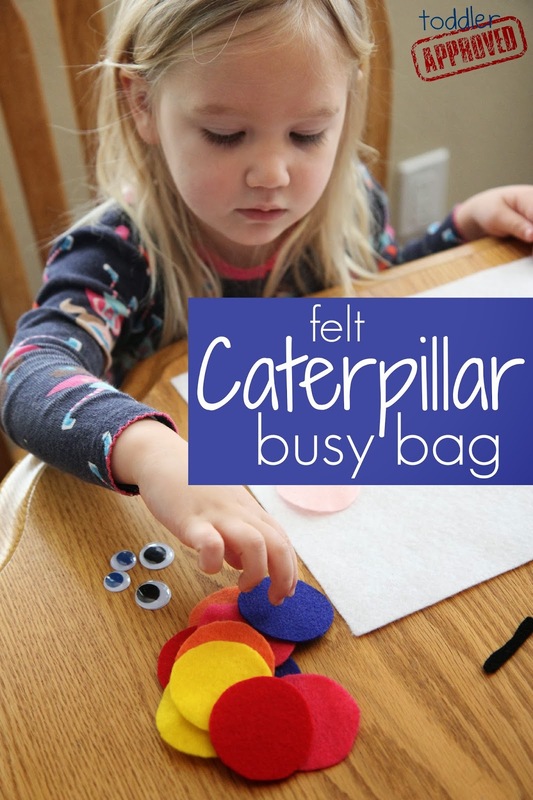 We've been having fun playing and learning while reading Eric Carle's The Very Hungry Caterpillar so decided to make a simple felt caterpillar busy bag to go along with the book. 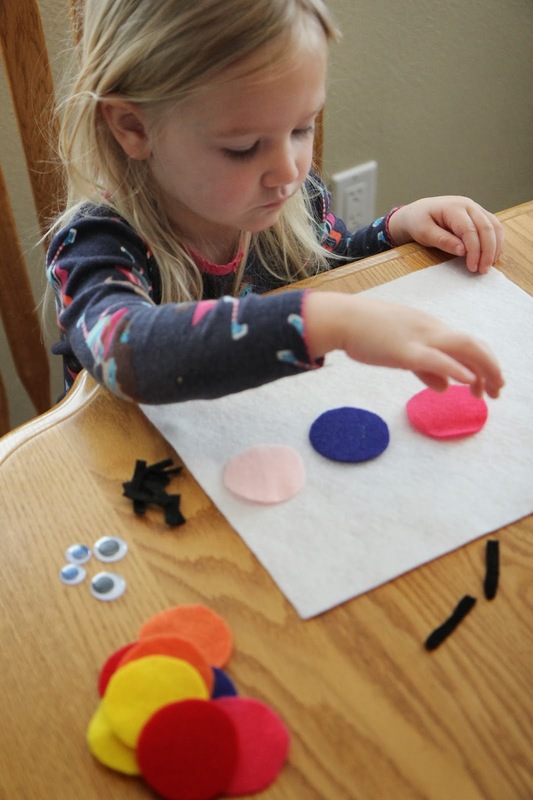 Before you get started you need to use your scissors to cut your colored felt into little circles. I traced a bottle top to get them all to be the same size. Next cut little strips to be legs and antennae. Once you have all of your little pieces you are ready to start creating!! You can tell your kids to try and make a caterpillar or you can just leave it more open ended and let them play and explore with the circles googly eyes and strips. 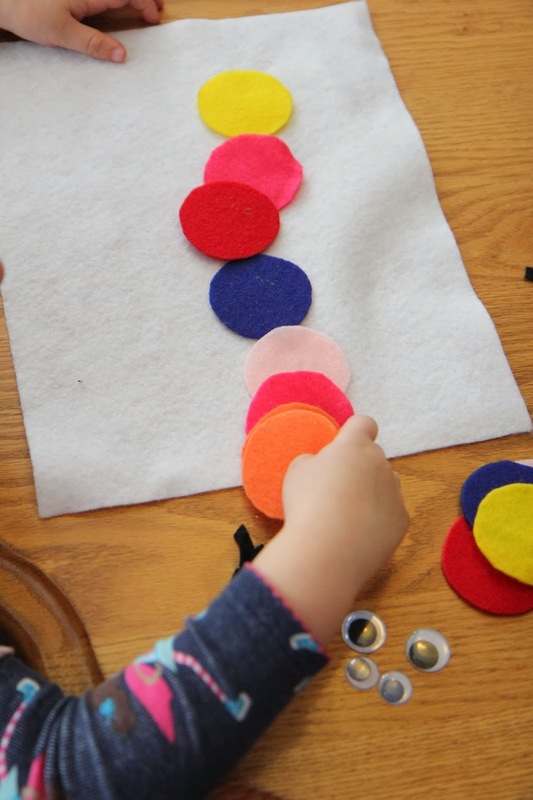 My three-year-old made long colored circle lines, made a caterpillar, and then just had fun sorting googly eyes and moving the colored circles around. She loved it! I don't restrict googly eyes because they are way too much fun to play with... so our caterpillars had a lot. After your kiddos create for awhile you can easily stick everything into a ziploc bag to save it for later. We also had fun making silly little bugs. Make sure to check out all our favorite busy bags on ous Busy Bags for the Kiddos Pinterest board. I think this will be the perfect sick day activity for my son today-thank you!